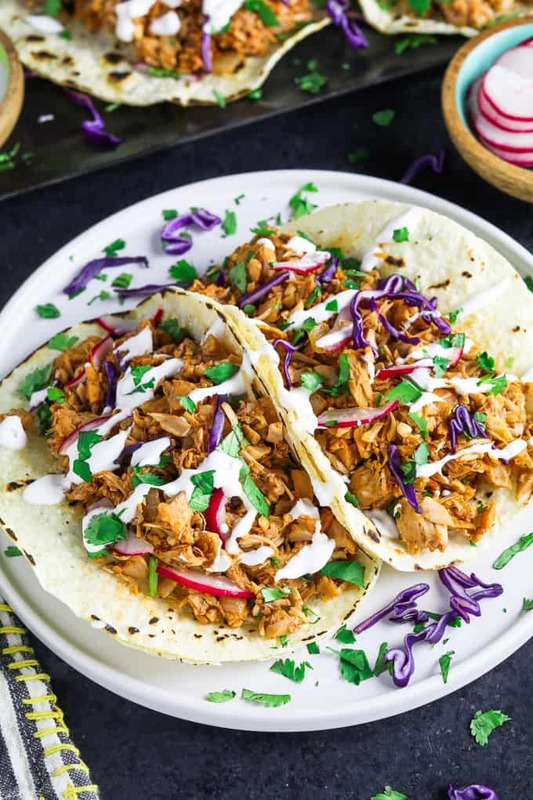 Taco night will never be the same with these mouth-watering Jackfruit Tacos. 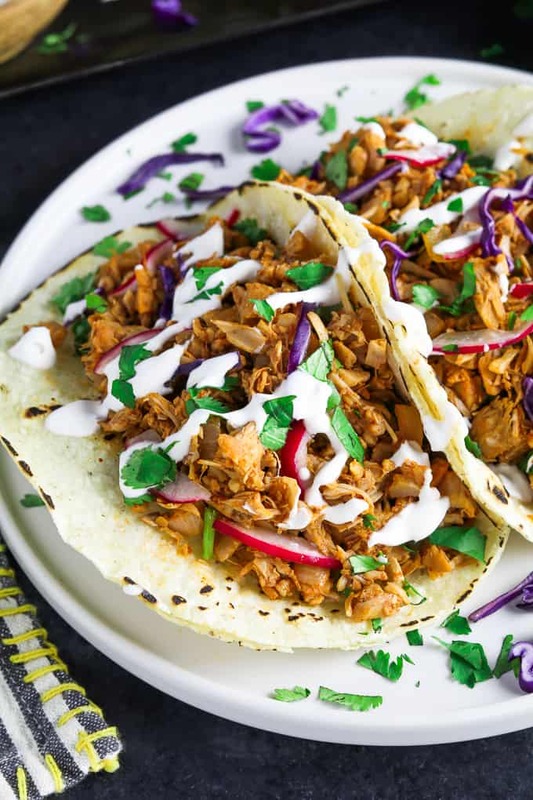 The texture of shredded jackfruit is the perfect replacement for traditional pork tacos. It will knock your socks off! 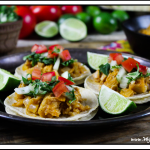 Fruit as a replacement for taco meat – what kind of sorcery is this? I know it sounds completely nuts, but it’s freaking delicious and the texture is spot-on! You’ve gotta trust me and give it a try. They are super easy to make, kid-friendly, and they will be on your table in 30 minutes! 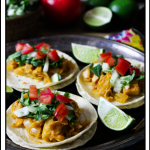 I love making them for Taco Tuesday with Loaded Vegan Nachos and Blood Orange Margaritas. They’re always a hit! Jackfruit is a tropical fruit from Southeast Asia and it looks like a giant dinosaur fruit. Seriously, it’s a super long, prickly, green monster! It’s one of the largest fruits on the planet and can reach up to 50 pounds. Totally Jurassic Park! It has a meaty, fibrous texture and it’s packed with nutrition. The jackfruit tree can grow up to 150 jackfruits over two harvest seasons and all that fruit can feed an army. When a jackfruit is fully ripened, it’s very sweet and almost tastes like Juicy Fruit gum. It tastes wonderful when it’s fresh, but it’s really messy to cut, so I don’t buy it often. You can find fresh or unripened jackfruit (young) in the can though. 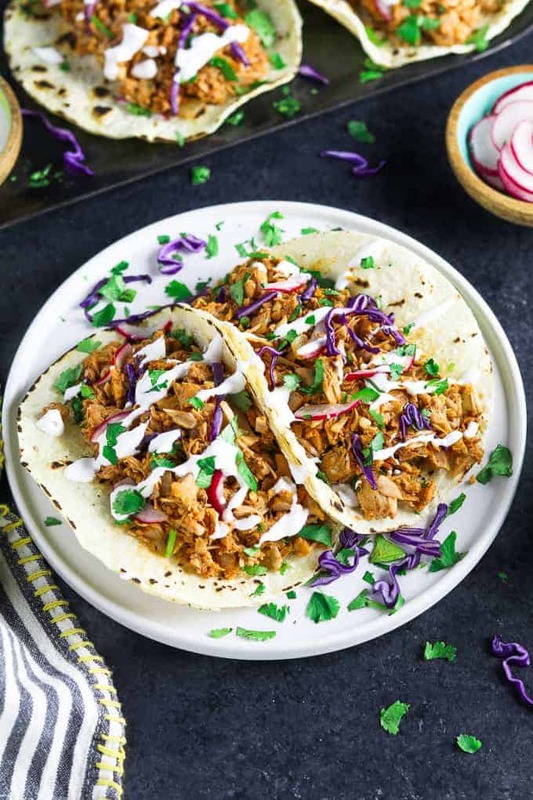 The unripened jackfruit is virtually tasteless and it has the ability to absorb lots of flavor from seasonings. Also, it has an uncanny resemblance and texture to shredded meat which makes it a great replacement to pulled-pork, chicken or fish recipes. When it cooks it will fall apart and shred, while absorbing all the goodness. You can also shred it beforehand to speed up the cooking process. 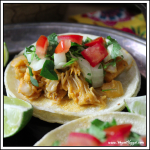 For savory recipes, you need to buy canned Young Jackfruit in water or brine. 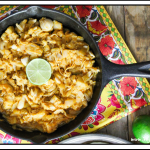 Whatever you do, don’t buy the jackfruit packed in syrup for this recipe. It won’t be what you are expecting. If you can’t find jackfruit in your local grocery store, you can find it in most Asian grocery stores or markets. 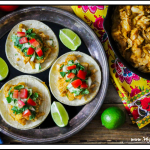 HOW TO MAKE JACKFRUIT TACOS? 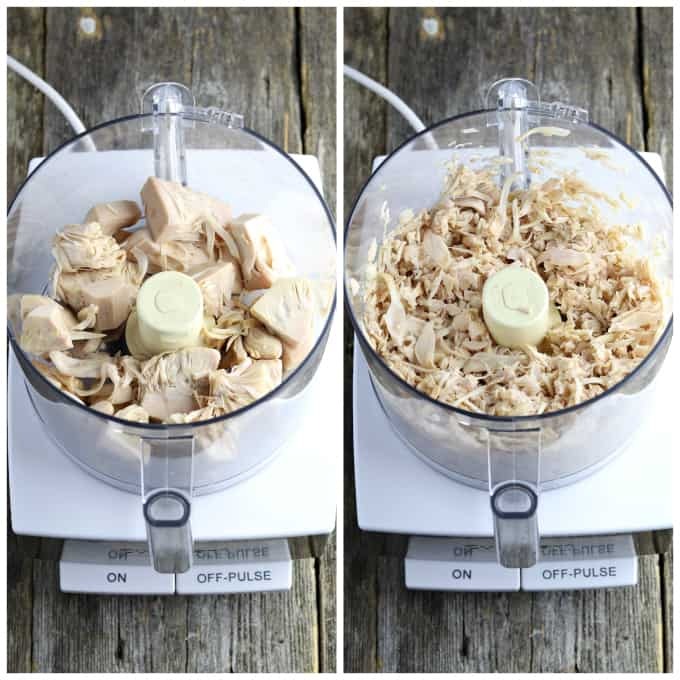 Shred the jackfruit in a Food Processor by pulsing a few times to get a “shredded meat” texture. Don’t over pulse or it will be mushy. If you have a small food processor, you may need to work in batches. If you don’t have a food processor, you can cut the jackfruit into thin slices and shred some by hand. Heat oil in a large pan over medium heat. Add onion and sauté until translucent. Add the garlic and sauté until fragrant. Now add the tomato paste and cook for 30-60 seconds. Add the shredded jackfruit and sauté for a few minutes. Now add the spices and sauté until fragrant. Pour in the vegetable broth and simmer until it has cooked down completely. Taste for seasoning and add more if needed. Remove from heat. Warm up your corn tortillas one at a time in a large skillet over medium heat. Cook for 30 seconds on each side to soften. 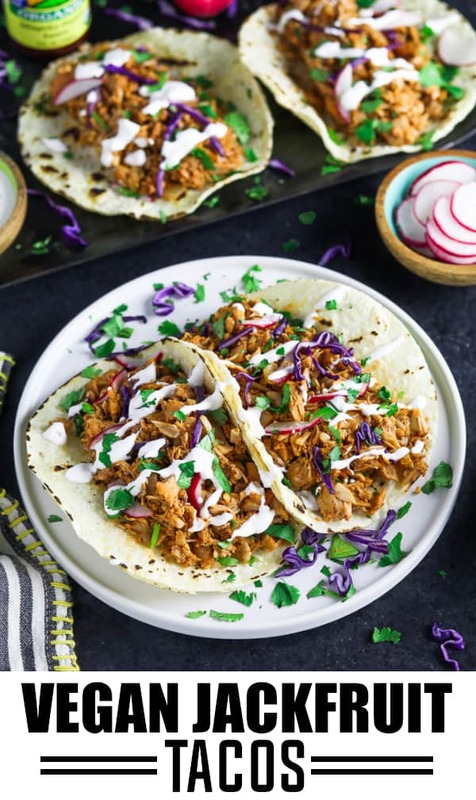 WHAT CAN I SERVE WITH JACKFRUIT TACOS? 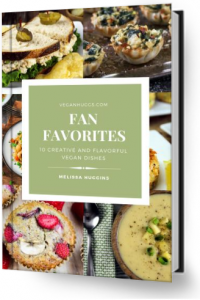 The options are endless, but here are some of my favorites: Lime Wedges, Vegan Sour Cream, Fresh-Cut Cilantro, Sliced Green Onion, Hot Sauce, Salsa, Pico De Gallo, Sliced Radishes, Shredded Red Cabbage, Creamy Chipotle Sauce, Guacamole. 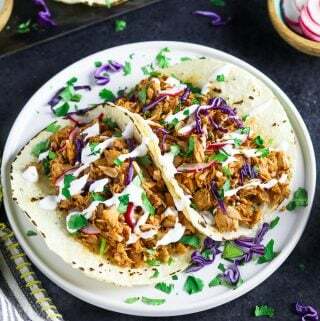 If you make these jackfruit tacos, let me know what you think by ★ star rating it and leaving a comment below. It would really make my day. You can also follow me on Instagram and share your creation with me. Just tag me @veganhuggs and hashtag #veganhuggs so I don’t miss it. Start by shredding the jackfruit in a food processor. Pulse a few times to get a "shredded meat" texture. Don't over pulse or it will be mushy. If you have a small food processor, you may need to work in batches. If you don't have a food processor, you can cut the jackfruit into thin slices and shred some by hand. Heat oil in a large pan over medium heat. Add onion and sauté until translucent, about 2-3 minutes. Add the garlic and sauté for 30-60 seconds until fragrant. Now add the tomato paste and cook for 30-60 seconds more. Add the shredded jackfruit and sauté for 2-3 minutes. Now add the spices and sauté until fragrant about 1 minute. Pour in the vegetable broth and cook until the liquid has cooked down completely about 3-4 minutes. Taste for seasoning and add more if needed. Remove from heat. Warm up your corn tortillas one at a time in a large skillet over medium heat. 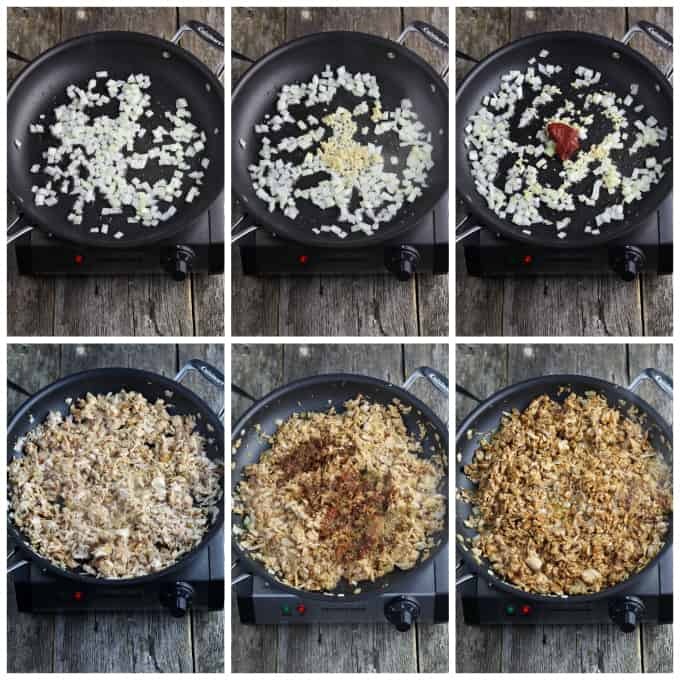 Cook for 30 seconds on each side. Now build tacos to your taste. See notes for serving ideas. Enjoy! SERVING/TOPPING IDEAS: Lime Wedges, Vegan Sour Cream, Fresh-Cut Cilantro, Sliced Green Onion, Hot Sauce, Sliced Radishes, Salsa, Pico De Gallo, Shredded Red Cabbage. I love this recipe! I use it to make enchiladas instead of carnitas and I also add some chipotle for spice.thanks for a great recipe.